Tonkatsu chef by day, professional DJ by night—this is the aspiration of Agetarou Katsumata, whose family owns a small tonkatsu shop in Shibuya. One night, Agetarou delivers an order to a staff member at a nightclub and gets invited inside as a token of thanks. Although nervous at first, he soon finds himself absorbed by the atmosphere, falling in love with the dancing girls, flashing lights, and groovy music. Agetarou starts visiting the club regularly until a certain night leads him to a chance encounter with a legendary American DJ: Big Master Fly. Putting on a spectacular show, the DJ sparks an epiphany in Agetarou—the groove of mixing music appears to be strikingly similar to the rhythm of preparing tonkatsu. Thenceforth Agetarou sets his sights on becoming a master of both disciplines. With the help of his neighborhood friends and his mentor DJ Oily, Agetarou pursues his dream all the while dealing with familial problems, love issues, and many other kinds of trouble. 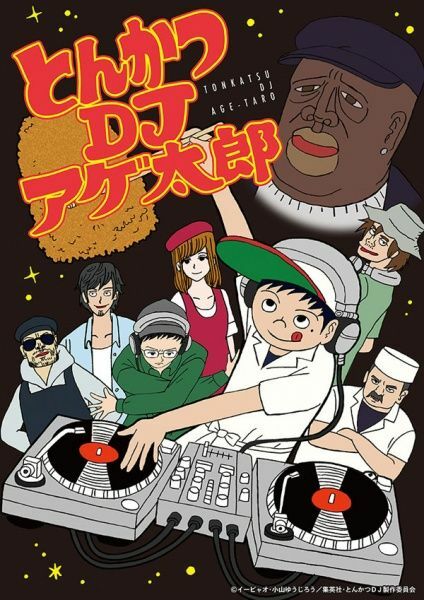 Tonkatsu DJ Agetarou is a hilarious tale about an impulsive young boy trying to find his own path in life, while still fulfilling his familial and social responsibilities.